It’s not very often that I make a video tutorial that I really love, but I think I did it today! In this video tutorial I show you everything that goes into making a full website design with a Horizontal Menu. I not only show you everything, I try to do it using the least amount of code possible. In doing that I think you will be able to easily make your own web designs. You will benefit by watching this tutorial first CSS Website Layouts. After that print out the code that follows the video and you are well on your way to making your on sites with horizontal menus. I am not able to link external java to html while creating menu bar, It doesn’t come horizontal, what I did I made a folder in desktop, with menu.css, menu.js, and menu.html, when I am trying to apply java to html, menu bar doesn’t come horizontal whereas it shows only css and html with no java in it…I guess I m doing something wrong. Please advice. I am also using this http://rendur.com/ to learn css, which very useful…….Please advice what steps do I need to follow to avoid problem. No, Derek. I am trying my best to fix this problem but again with the same results. But when tried to link those each other, css link is working but menu.js is not working. I never did this before, that is why I am having this problem. Hi, Try the code in this tutorial instead Cross Browser Menu Tutorial. Everything is in one file. It works on every browser since IE 5.5. 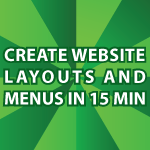 It works as a regular website menu as well as a WordPress menu. It is just about perfect. Thanks for this tutorial i learned a lot from you. I hope you will continue to share your expertise. Hi, I’m playing around with your examples and there is one thing. Can you change tabs -> spaces -> & nbsp. It is hard to read with everything aligned to the left. Original formatting would help a lot. I think my question is similar to Damian’s above. I dev’ed a drop-down like this in CSS3 via Lynda.com for my portfolio website when taking HTML5 Fall, 2012. But now i’m dev’ing a site for someone and the menu bar looks better centered because of logo being on the left. I can get it to center by putting a bunch of &nbsp in the div section but it looks unprofessional and I then get wraparound when zooming in. Check out my CSS video tutorial. I cover everything you’ll ever need there. Can you tell me how to center the whole menu bar on the screen? I tried this with my CSS3 menu bar and it’s not going well. I’ll start playing with yours and see if i can get it to center. If there’s something incorrect about this comment please advise how to correct it, as my comment from yesterday is gone. You can do it in a few ways. Here is my CSS video tutorial. It covers pretty much everything you’ll ever need.